Lincoln, Santa, Bill Oddie and now Dave! Since before Christmas, the big topic of conversation in our household (apart from tea towels) has been the recent acquisition of Dave's beard. It first started after a long, lazy weekend, with Dave not shaving on the Monday morning. It then developed into a rather fetching, designer affair, short enough to still be smart. It's now big enough to make me think of bears and hiking - I do love it though! 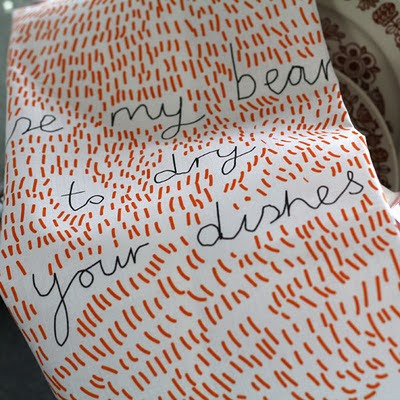 When we saw that Donna Wilson had managed to combine both beards and drying dishes, in her superb Use My Beard tea towel, we knew we had to stock it!! 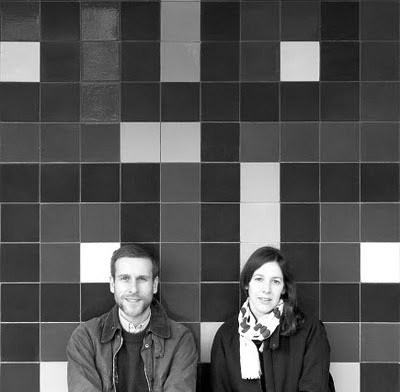 We were in London recently and, quite by chance, met up with the wonderful couple behind Lisa Jones Studio. We are excited to bring you this interview with Lisa and Edward; they are a super-talented duo who never fail to put a smile on our faces with their gorgeous prints, cards and tea towels! Tell us a bit about Lisa Jones Studio – who are you and how did you get started? The name’s a bit misleading as I work with my partner, Edward. We met studying Fine Art, but after a time I fancied trying my hand at something more upbeat. Surprisingly he showed an aptitude too! The new wave of illustration hadn't exactly broken and design-conscious stationery was especially thin-on-the-ground. Now, admittedly, the competition is fairly healthy. You obviously have a love of animals; if you could be any animal, what would it be and why? Tough question! While it’s hard not to invest creatures with human attributes or simply use them as metaphor for mood, I guess I feel mostly like a bear. Though there's always the hope it'll be something more kinetic and mischievous tomorrow. What were the last books that you read and would you recommend them? I just finished Graham Greene's 'The Ministry of Fear', which was like watching the best Hitchcock film. Before that I read Michael Cunningham's 'A Home at the End of the World', which I'd recommend unequivocally. Edward's just finished 'The Woodshed' by Rayner Heppenstall, now he's reading a biography of pioneering clown, Joseph Grimaldi. He doesn't want to do either down, but says there are plenty of others he'd recommend first. 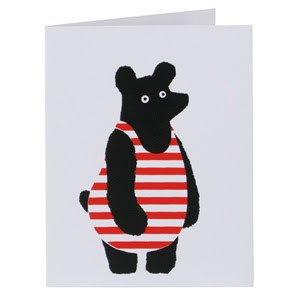 Do you prefer cards and stationery as a medium for your designs? How did that side of your work evolve? Without an agent, a product or the nerve to go touting yourself, greetings are an excellent medium; essentially, you're illustrating an occasion. Cards did help us define our style and gain confidence to move into other areas, but I won't be forsaking them anytime soon. I still thrill to see their pristinely packaged, multicoloured spines displayed and, besides, it’s a thrifty way of procuring hand-printed artworks! 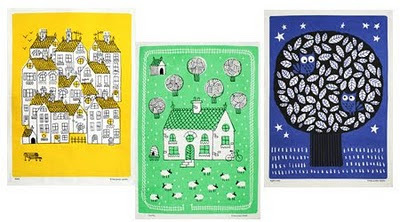 Has it been fun to produce tea towels? When you produce most things in-house, it's pretty daunting outsourcing; you have to re-calibrate a little. Fair Trade organisations still seem to function more like pro-active charities than regular businesses, so initially it was tough finding a balance between maintaining standards and acting the prima donna. On the flip side, the workload's a joy and I love the way the expanding range is sitting together. 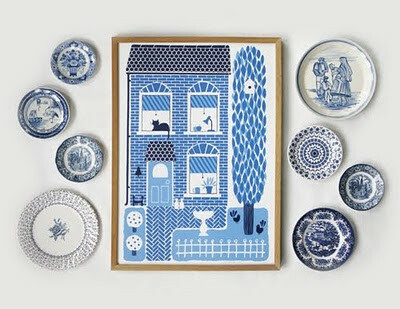 We’re excited about the prospect of Lisa Jones Studio ceramics – are you able to give us any sneak previews/tell us a bit more about what you have in the pipeline? I'm excited too! It’s taken an age to develop designs that are vaguely reproducible; there are so many variables! On the studio-pottery side, I have two wall-tiles ready to go and a figurine maquette crying-out to be cast. With a far more factory feel, we're also adapting designs for a range of graphic mugs. I only wish I’d done them years ago. What’s a normal day like at Lisa Jones Studio? With creativity taking up such a slim percentage of our working day, the remainder's too mundane to describe without itemising packed-lunches or resorting to lies. Usually it's a rotation of mouse-clicking, printing and box packing set to audiobooks, iTunes or DAB. Luckily, for much of the year we get to bookend the day by cycling along the canal, sometimes stopping way too long at the old filter beds on route. Can you take us through your creative process – where do you find your inspiration? Hopefully we approach each project with the same sense of fun, though most times the medium is silk-screen, which also requires an element of frugality. Because every colour represents additional reproductive labour, we keep our fingers crossed that the less-is-more mantra still holds sway. In terms of influence, I'm still enjoying the pattern and texture of mid-20th century ceramics and busy rediscovering a world of wonderfully decorative art I was dumb enough to dismiss as a student. For inspiration we also have a large selection of tattered old picture books. 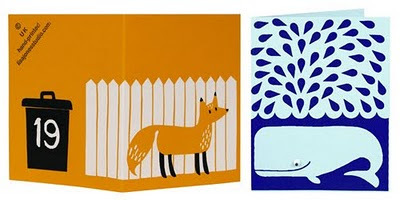 One of our favourite illustrators was recently in touch over a blog entry we'd made. I was mortified to learn she'd read what we'd written, but equally excited to hear her on the answer-phone. 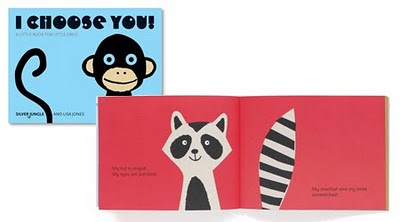 Your illustrated book ‘I Choose You!’ is amazing – do you have any favourite children’s books from your own childhoods? Oh, thank you, pleased you like it. It's such a competitive arena, with a host of great talent right now. It's peculiar though, much as I love the classic picture-books and the mania for reissues, those that stick in my mind probably don't score big on the cool-o-meter. The Worst Witch's outfit and hairdo figure strongly for me, as does ‘Mrs. Pepperpot'. While Edward affectionately recalls hyper-busy Richard Scarry books or Michael Foreman's 1974 eco-fable, 'Dinosaurs'. For shear impact though, it has to be 'Where Do Babies Come From?' Edward’s forthright mum would leave a copy hanging around to better educate the neighbourhood kids passing through. A contentious ploy that ended pretty well all-told; I think a number of parents were genuinely relieved! And finally, who does the washing up in your household (and do the dishes get dried up with your own tea towels)? On no, rumbled! Edward usually does the washing (in the style of Animal, the Muppet drummer), but neither of us actually dry; we just leave it to air, like bone-idle teens. As unrepentant hoarders, we do have a drawer-full of tea towels, ranging from the vintage to the recent and—purely for the sake of appearance—one each of our own. 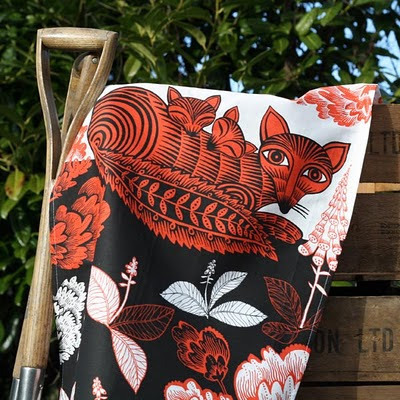 Designed by Lush Designs and priced at £10, this tea towel will surely bring out the vixen in you (sometimes we can't actually believe it's possible to be this cheesy)! !